An apparent Cardassian war criminal comes to the station, and Kira is charged with uncovering his true identity. This is a stunningly good episode that marks DS9's coming of age. It tells a clever story wrapped in moral ambiguity, hard questions, dark problems, loaded historical parallels, and fascinating, complex characters. Though TNG danced on the edges of stories like this ("The Defector" and "Chain of Command, Part II" spring to mind), no previous Star Trek show could have ever gotten away with "Duet." Kira is allowed, by virtue of not being Starfleet, to be ethically compromised, and thus she is useful here as a foil for someone like Aamin Marritza, as a way to comment on things as deathly serious as wartime atrocities, genocide, and terrorism. At first, it starts like Star Trek's answer to Death and the Maiden, with the puzzle of Marritza's identity front and center. However, the tables are quickly turned on Kira after Sisko unwisely puts her in charge of the investigation. Her objectivity is not only called into question, but also whether or not she should be judged for her own war crimes. Then it becomes a dance (nay, a "duet") between two people who are all too eager to hate. 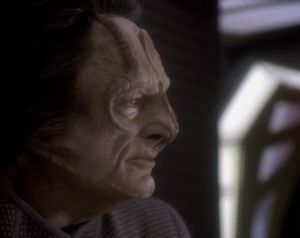 When it is revealed that the man in the cell is, in fact, Marritza, it becomes obvious that he hates what the Cardassians did as much as Kira does, and his desire for justice and vengeance extends so far that he is willing to give himself the death penalty to atone for his own cowardice. There are a lot of smaller confrontations going on, too. Sisko has to contend with the Bajorans and the Cardassians, each of whom have a vested interest in the identity of the man in the cell, and he has to confront Kira on whether or not he can trust her to learn the truth. One scene that stands out is a confrontation between Odo and Dukat, where Odo once again demonstrates his mastery of information gathering. One has to wonder whether Odo learned this skill from Cardassians like Dukat, or if he simply earned the Cardassians' respect by being better at it than they are. Marritza, in many ways, reminds me of some of the best Cardassians we've seen so far, including Dukat, Garak, and even Gul Madred. His every line of dialogue is biting and full of multiple layers of meaning, and the actor who plays him, Harris Yulin (who will forever be the NSA director from the second season of 24 in my mind), is absolutely incredible. The combative chemistry he forms with Kira--which easily mutates into a shared pain in the end--is truly effective and poignant, and this is a relationship that should stay with Kira's character from this point forward. This episode has a lot in common with the similarly-named "Waltz," in which Sisko and Dukat debate whether or not Dukat is an evil man.